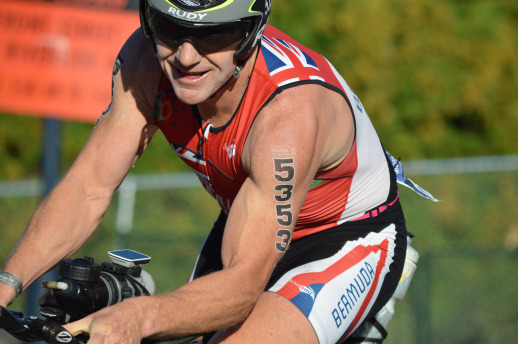 The Bermuda Triathlon Association held their Labor Day Home Event in Harrington Sound. Geoff Smith and Laura Norman are the Male and Female champions in the Senior Division that saw competitors cover a distance of 750m Swim, 18.4k Bike and 4.7k Run. Smith clocked a time of 1:00.09, he came out of the water in a time of 11.33, he clocked the fastest Bike time of 29.19, before clocking the third fastest Run time of 19.17. Norman was 11th overall, she clocked a time of 1:09.57, she came out of the water in a time of 12.06, Norman then clocked 36.49 on the Bike, before closing out with a time of 21.02 on the Run Course. Jon Thompson	- 20.44	team with "Spanner"